Well aparently the past doesn't die, at least in JJ's world. All I ask are two things. Give me some Anakin and make Rey a Skywalker as she should be. Why "should" she be a Skywalker? No one else in the Star Wars universe over than Luke, Anakin and Ben's lineage matters. No one knows Obi Wan's lineage, Yoda's lineage, Palpatine's lineage (except that he's from a wealthy Naboo family), so on so forth. Why does it matter that Rey is a Skywalker? Why can't Rey be a perfect representation of the force becoming active again and rising to meet the over powerful dark side? What we know is that the force Awakening was an event. It was touched on in the film with the scene, where Kylo is talking to Snoke before the attack on Takodana. But the force wasn't active. More specifically the Cosmic Force. Rey rose to equal Kylo because the balance in the force was thrown off. I'll throw a counter point at you. What if Rey's job is to bring balance to the force. And doing so requires an end to the Skywalker bloodline. Which we know was created by Plagueis/Palpatine. A bastardization of the force. And while Luke was a hero who defeated the Sith, the seed of the sith still carried on through their blood. Rey is experiencing a swell in power which is the Cosmic force coming through her, amplifying her powers so she's able to take down the Skywalker bloodline and truly bring balance to the force. I mean anything is possible in the world of Star Wars, but a fall from 500 meters after taking the full brunt of Palpatine's force lightning. Also worth noting that he fell into Coruscant. Anyway yes i think it could be really fun, mainly as a short comic series. This story is about family. Three generations of one bloodline. The father, his children, his grandchildren. Leave the metaphysical force crap for when all we have all original Disney characters. Ep. 8 was terrible so much so I act as if it doesn't exist. My opinion simply is Star Wars may not be what Disney expects w/o the Skywalkers. It is an absolute shame George let the prequel haters scare him off from finishing his story. Disney brought Lucas back on board for this to help JJ. They've already used two of his ideas that were scrapped that he pitched when Disney bought Lucasfilm. The submerged Death Star and Palpatine being alive were both his ideas (in addition to Skywalker cousins being the emphasis of the trilogy) that Disney turned down. I'm glad Disney is letting the man who created this wonderful universe back in to help close it, instead of giving into the Lucas haters like zeets turn it into something it's not. People like zeets have fought long and hard to defend The Last Jedi. It was underwhelming and really doesn't have the replay value the other movies do. I don't feel like engaging into another arguefest with zeets about this. We know he hates the prequels and thinks Lucas has nothing to do with the success of the franchise. If up to fans like him we'd get nothing but TLJ movies. Or you know a droid or recording. Palapatine had a lot of machinations moving around. Basically soon after taking over the Empire he pretty much stopped dealing with the day to day stuff and worked only on big picture stuff, some of it very odd. I'm about half way through Thrawn Alliances which takes place really close to Battle of Yavin (takes place basically right after Season 3 of Rebels after the Bentu wrecks Thrawn's forces. 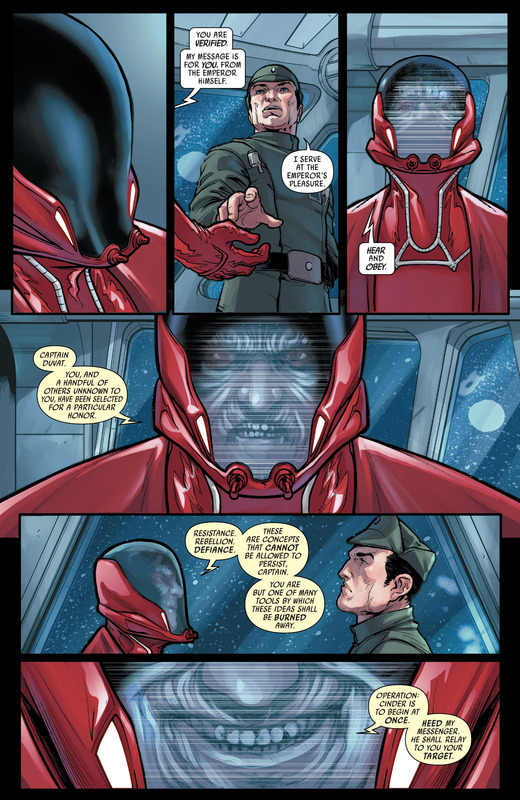 Palpatine sends Vader and Thrawn out to the Unknown Regions to investigate a disturbance in the force. THis is the type of thing Palpatine was doing probing with the force all around the Galaxy, trying to discover everything he can. So he had all kinds of plots and ploys that existed in the world His downfall was his own hubris. But perhaps he even saw that and had other plans out there. The "metaphysical force crap" was what a healthy amount of the OT was about. "Size matters not. Look at me. Judge me by my size, do you? Hmm? Hmm. And well you should not. For my ally is the Force, and a powerful ally it is. Life creates it, makes it grow. Its energy surrounds us and binds us. Luminous beings are we, not this crude matter. You must feel the Force around you; here, between you, me, the tree, the rock, everywhere, yes. Even between the land and the ship." The force was always mystical. The idea as it was more or less presented in the OT was the force was something that existed that a master could teach you. Kind of like for lack of a better term a secret fighting style. Lucasfilm (and Disney) found some amazing success with Star Wars without the Skywalkers. Rebels was a resounding success with some intervention from main trilogy characters and some prequel characters. Creating characters that fans love like Caleb, Ezra, Zeb, Hera, and Sabine. As well as villains like Thrawn, Governor Price, etc. What Star Wars is, was and should always be is an Opera. What makes an Opera what it is the grand scale and the tale of a hero vs. antagonist. In the OT it was Luke vs. Vader. In the new trilogy it's Rey vs. Kylo, in the prequels it's Anakin vs. the Jedi. Now that battle resolves itself in a number of ways. Luke turned his father from the darkside resulting in him sacrificing himself and giving himself to the light. Anakin wanted to be part of the Jedi order, but not for the right reasons and he was admitted anyway. If up to fans like him we'd get nothing but TLJ movies. You mean a bunch of well directed movies? Heck yeah. Here's the reality, Lucas did a bunch of things wrong in the prequels. I know you like them, we've discussed it a bunch. I won't go into it. But he created a dump of issues in the prequels. From continuity issues (Obi Wan aging 50 years in 20 years, Obi Wan "hiding" with his name and his Jedi Order outfit on the planet Darth Vader was born with the savior to the galaxy, Leia remembering her mother, Obi Wan's interactions with Vader and R2/3PO have totally different meanings given their 5+ year bonds, somehow in 20 years the Jedi went from the forgotten order to forgotten by everyone, Qui Gon taught Yoda and Obi Wan how to be force ghosts, how did ANakin become a force ghost at the end of episode 3, much less how did he come that far to the light after personally killing defenseless younglings) to the weird use of CGI to making plot points that didn't matter. Listen lucas is a great idea man. And I think honestly his best work was the Clone Wars TV show. It allowed him to invest time into political intrigue because there we dozens of hours of content. That failed miserably in the prequels. They were less Opera more Spaghetti Western smash cut with 1980s action film.